An exemplary 1.4 acres on Main Street in Trappe is the latest property to achieve Bay-Wise Certification through the University of Maryland Extension Master Gardener Program. The certification was presented to Cathy Schmidt, who owns the property at 4282 Main Street with her husband, Brian. The Schmidts are proprietors of Garden & Garnish, a local catering business whose headquarters and commercial kitchen occupy the newly certified site along with the Schmidt’s family residence. Several factors helped to rate the property as sustainable and “Bay-Wise,” according to Bay-Wise Team Leader Mikaela Boley. These factors include several large mature trees, flowering shrubs and beds of native plants that attract birds and pollinators, plus a sumptuous garden that supplies fresh vegetables and herbs for the catering business. 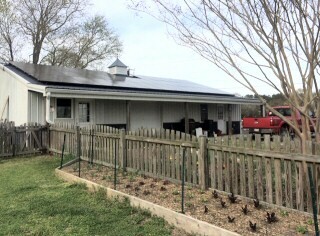 In addition, the property owners utilize crop rotation practices, as well as composting, self-mulching, six rain barrels and a commercial kitchen roofed with solar panels. The rain barrels harvest water for irrigation; the solar panels cut energy consumption by 30% on average for the year. While the property has extensive turfgrass, part of the turf and all of the ditches have been naturalized to ease storm water runoff. 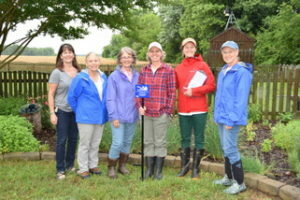 Assisting Boley in the certification visit in mid-June were Talbot County Master Gardener volunteers Sharon Morrison, Mary Ellen Olcese, Kathi Bangert, and Mary Revell. The visit included an expert consultation to discuss the property owner’s plant and landscape challenges and future plans for a wildflower field. Because Cathy Schmidt is herself a Master Gardener, the newly certified property will officially serve as a demonstration landscape that others can emulate. 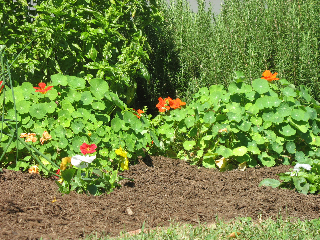 For details on the Talbot Master Gardener Bay-Wise program, contact mboley@umd.edu / 410-822-1244. 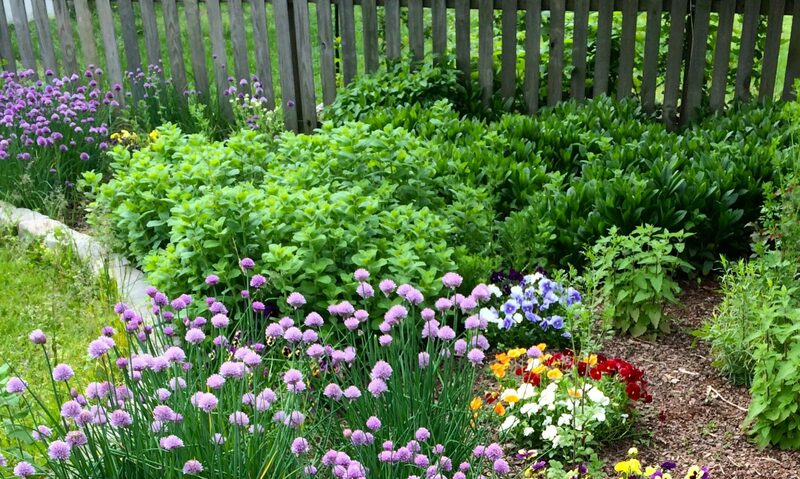 Garden and Garnish Gets Greener! In the Spring of 2016, we installed an 11,000 kW solar system on the roof of our catering facility. This should provide us without least 30% of our electric needs. Planted in the garden beds in the foreground are 36 lettuce plants including the varieties: butter crunch, red romaine, green romaine and red oak. Also, planted the garden are brussels sprouts, cauliflower, and sugar snap peas. 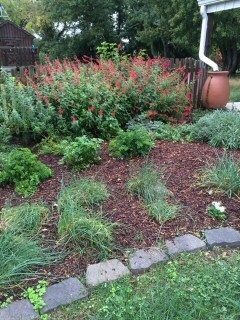 Not pictured is our berry garden which includes strawberries, red raspberries and thornless blackberries. 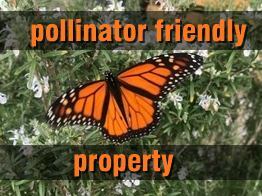 In addition, our gardens are pollinator friendly. The name “Garden & Garnish” was a natural choice as we deliver “fresh from the garden” quality and eye-catching presentation. We like to use a broad assortment of fresh vegetables and garnishes from our own herb garden, and take pride in developing seasonal dishes that utilize many local ingredients from Eastern Shore farmers and watermen. 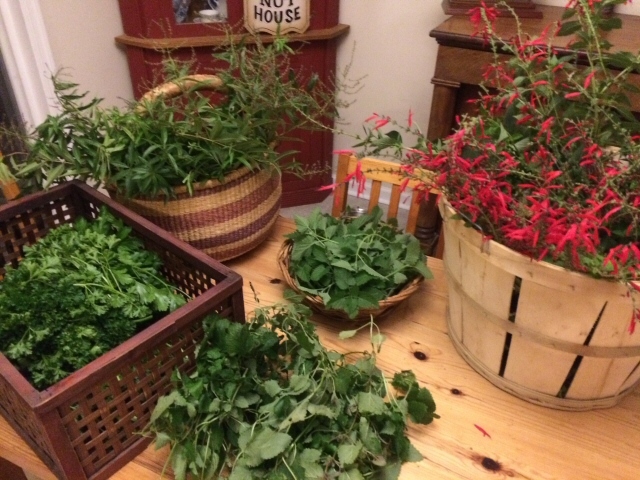 From the beginning, Garden & Garnish has always used the freshest local ingredients available. The Eastern Shore has the best to offer when it comes to crab meat, strawberries, melons, asparagus, sweet corn, tomatoes, peaches, blackberries, squash, green beans and such. We are proud to be a certified member of the “True Blue” program. This means that we are committed to using only Maryland caught crabmeat. We also support the Maryland Seafood Industry by buying fresh local seafood as much as possible. Our herbs and garnishes we grow ourselves and use our own homegrown tomatoes, cucumbers, squash, melons, and peppers when in season. We also use “Emily’s Produce” in Cambridge. We have a very special person in our community, Mr. Donald Brown, that distributes our leftovers to local churches, shelters and family centers. *New green disposables are becoming available everyday, so do not hesitate to ask for products not listed here. We recycle glass, metal, plastic and paper, which includes the wine and beer bottles from your event. We continue to compost. When possible we encourage our staff to carpool with each other to our catered events. Our staff have really jumped on board with this one, it’s lonely to arrive by yourself ! 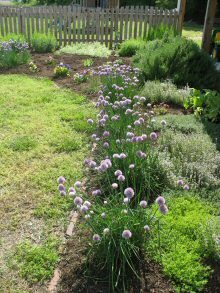 In July of 2012, we successfully installed rain barrels and the rainwater collected is being used to water our herbs and vegetable gardens. Little by little we are making small improvements within our business to decrease our waste, limit our energy use and transition into a greener company. We believe that supporting local merchants when possible limits the distance items have to travel to reach us and in turn reach your table.